Pyrography or pyrogravure is the art of decorating wood or other materials with burn marks resulting from the controlled application of a heated object such as a poker. It is also known as pokerwork or wood burning. It translates literally as 'writing with fire' The term means "writing with fire", from the Greek pur (fire) and graphos (writing). 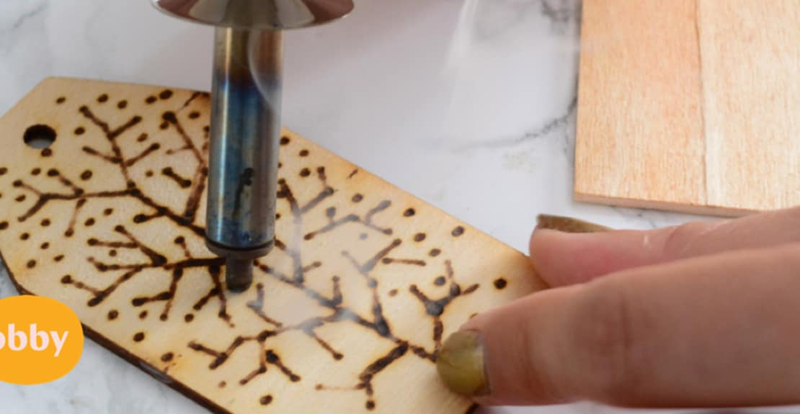 It can be practised using specialised modern pyrography tools or using a metal implement heated in a fire, or even sunlight concentrated with a magnifying lens. Historically pyrography was used to decorate and brand various tools and musical instruments. It was used as an art form to distinguish people's belongings from others, and show a little personality. It wasn't until the late Victorian era that the art became recognised in earnest and done on blank canvases of wood as an art form instead of just as a decorative purpose. Soldering pens were originally developed in the early 20th century. These early versions of the tools we use today in pyrography are what made this art so accessible. Similar to how you would use different weight in pencil, you can alter the tips of your pyrography pen to alter the appearance of your design. You can also alter the temperature and the pressure or way the iron from the tip of your pen is applied to the material to create different effects. In fact, you can now purchase certain tips to add to your soldering pen that is pre-designed, meaning you don't have to be comfortable at drawing in freehand to achieve a design you love in pyrography. Once you've practised a little and built up your confidence, you'll be able to achieve your desired effect on various different wooden and leather objects. If you have decided this art may be something you are interested in, why not try out a class first? By attending a class you can try out various different pens and tips and pick up tricks from the teacher so you feel more comfortable starting it as a hobby yourself. It is human nature that if we are better at something or more comfortable doing it, we are more likely to carry it on, so it makes the ultimate sense to make sure you are comfortable in the art of 'fire-writing' before you set up your own pyrography studio at home.